POUR EXCUSE Woodley plays a wallflower willing to overlook the fact that her popular boyfriend is on track to become an AA student. James Ponsoldt has a drinking problem. The problem is that he apparently can’t stop making movies about drinking. Since 2006, he’s directed the following — and only the following: Off the Black, about the relationship between a teen and an alcoholic high school umpire; 2012’s Smashed, about the relationship between an alcoholic husband and wife; and this summer’s critical darling, The Spectacular Now. It’s about the relationship between two mismatched high school students, a wallflower who gets As and a charmer who gets drunk. There are artists who can pull this off. Charles Bukowski is an obvious example. Almost everything he wrote referenced drinking. Bukowski, however, was a genius, whereas Ponsoldt is a 35-year-old film school grad, a competent filmmaker better known for coaxing well-reviewed performances from actors than for telling stories that defy formula. The writer-director has told so many by-the-numbers addiction and recovery stories, in fact, that I wondered whether some dark secret, some substantial personal connection to substance abuse, drove him to visit the same theme again and again. I’ll tell you, uncovering the sordid truth took some googling. Ponsoldt clearly doesn’t like to talk about his struggle with the sauce. Probably because it didn’t amount to much. It reads like a pitch session for one of his pictures. Here’s the thing: Ponsoldt goes on to admit he’s talking about stuff that happened when he was 16. High school hijinks. James, you acted out in your teens; you didn’t get addicted to heroin and become a male prostitute in LA. You had a little too much fun growing up in Georgia. Get over it. 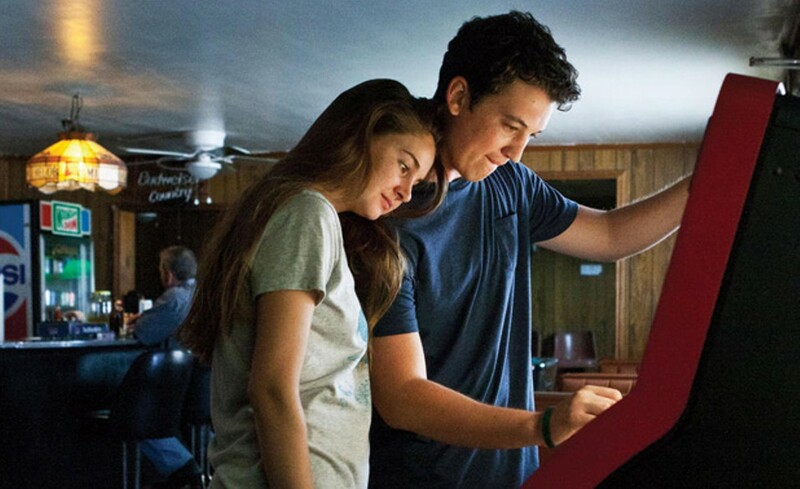 Now that we’ve solved that mystery, on to the question of why The Spectacular Now is among the summer’s highest-rated films when it’s little more than a well-intentioned but immensely predictable Say Anything… clone. In the John Cusack role, we have Miles Teller (Rabbit Hole) as Sutter, a senior who never leaves home without his flask. Filling Ione Skye’s shoes is Shailene Woodley (The Descendants) as Aimee, a beautiful bookworm who’s never had a boyfriend. Based on Tim Tharp’s acclaimed YA novel, the movie offers a coming-of-age tale that’s as familiar as it is affectingly acted. Sutter and Aimee find themselves attracted to each other, as opposites so often do, and run out the graduation-year clock going to class, to the prom and to bed together. As in the Cameron Crowe classic, daddy issues loom like dark clouds on the horizons of both characters’ stories. But it’s Sutter’s backstory that poops the party just as they come into welcome focus and the movie begins to hit its stride. In a third act bereft of a beat you can’t see coming miles away, our perpetually buzzed hero inexplicably takes his eye off the ball he’s having with this remarkable young creature (Woodley gives a performance of impressive depth) and insists on tracking down his deadbeat dad (Kyle Chandler). As is always the case, the guy lives surprisingly close by, hiding in plain sight. The reunion between the two proves to be a checklist of recovery-lit clichés — and, if I’m not wrong, manages to contribute a few new ones. I won’t even get into the movie’s trite, simple-minded ending. Let’s just say that the filmmaker would be well advised to branch out and explore new narrative territory, and a spectacular time to start would be now. * Running time: 95 min.